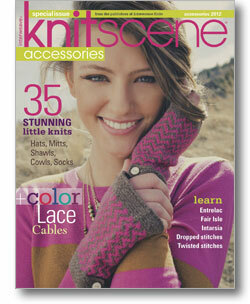 Knitscene is bigger than ever with 144 pages of 35 knitted accessories and knitting how-to articles. Easy knitting patterns for hats, shawls, socks, cowls, and more! Knitscene Accessories 2012 is Now Available! Get 35 stunning little knits! Take the knitted accessory to new heights with this super-sized special issue of Knitscene. With themed collections, plentiful tutorials, breathtaking photography, interesting features, and Knitscene's usual sense of style and focus on simplicity, this issue will be a shelf-keeper for years to come.